Before I started working with Lady Parts Justice League, I assumed that new abortion laws were few and far between. Maybe one year there would a law in Ohio, maybe the next year there would be one in Delaware but very rare and almost never anything major. 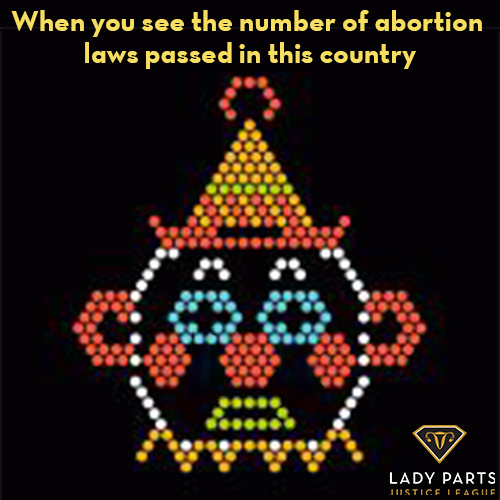 Like if computer put a red dot on the places with anti-choice legislation this year, it would be a tiny representation. Nope. That map would glow like a Lite-Brite. Seriously, you’d think the entire country came down with poison ivy. Here are a few, you tell me the time frame of these stories: A lawmaker in Oklahoma wants to classify abortion as felony homicide, a South Bend clinic was denied a permit by the state health department because it lacked ‘reputable and responsible character’, The Ohio Senate is voting on a bill that would ban abortion as early as 6 weeks and South Carolina lawmakers vowed to push for more abortion restriction in 2019. You’d probably say ‘wow, busy year’. That happened this week! And this is the norm! It’s not like there was a Black Friday sale on abortion haters so they all sprinted to their desks to be assholes. And what’s worse, you would at least hope that these would be based in science and would usually benefit women because progress tends to go in one direction, right? Nope. To these guys (and almost exclusively guys) science is soooo 2017 and God is 2019. Well, we’re here to call them out and push back but we can’t do it alone. I know there are tons or worthy charities out there but if you can, help us push by making a donation. Thanks.